Yesterday, my buddy Tobi and I were doing a Jump Houston adventure. We went to Hermann Park and stopped by a cute little restaurant called Pinewood Café, as per the recommendation of the super-friendly owners of RevolutionEBikes (an electric bike rental shop). They recommended we try a grilled cheese sandwich. At first, I was reluctant to buy a bread and cheese I could make at home. I was pleasantly surprised to find I had the option of adding a protein to the sandwich with no extra cost. I added steak, Tobi had chicken. 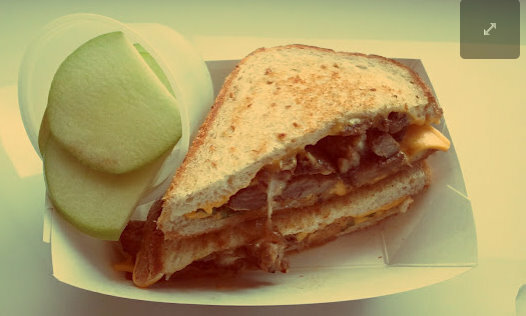 As soon as I bit into my Grilled Cheese & steak sandwich with a touch of cilantro, I realized every bite was worth the $5 that I paid for it! I like to keep my sandwich toppings bare to none, but I was impressed by the variety of toppings I could have put on the sandwich. I wanted apple slices, just not in the sandwich, so I opted to have them on the side. The meal was delicious and I was surprisingly full from the average size sandwich. I give this restaurant my NC stamp of approval without hesitation! I was satisfied with the sandwich. In fact, I wouldn’t mind trekking to Hermann Park right now for another one!